Vietnam is blessed with cultural and natural attractions throughout the three regions which means each region and destination has its distinct ideal time for visiting. For first-time visitors to Vietnam, worry no longer! 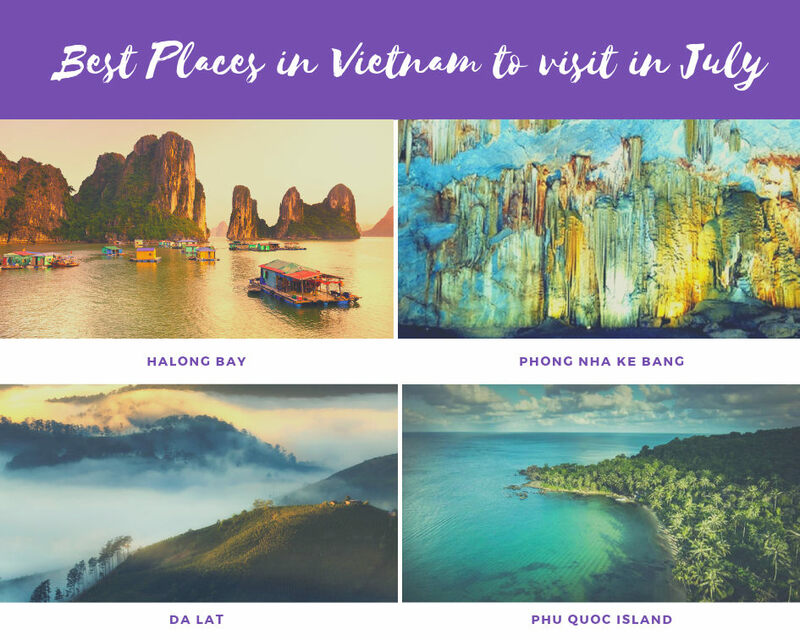 In this travel guide, we’ll show you in detail what to notice of weather in Vietnam, best time to visit Vietnam, when and where to visit Vietnam in the most visualized and easiest way to follow. Are you ready? At a first glance, anyone knows that Vietnam is a long country, stretching vertically and is divided into three main distinct climate zones: North, Central and South. In general, weather in Vietnam is deeply influenced by monsoon season which brings each region different weather characteristics, partly affected by the oceanic climate. Therefore, even though Vietnam is located in tropical area and adjacent to the equator, the climate of Vietnam is still milder than that of a lot countries that are located on the same latitude thanks to a winter season in northern part. North Vietnam – North Central Vietnam: four seasons with winter lasts from December – February, temperature dropping and low humidity. Summer from June to August is hot, rainy and humid. Central Vietnam: Tropical wet climate or a tropical monsoon and trade-wind littoral climate. Hot temperature almost all year round. Drier months lasts from November to April while in summer months the region suffers from storms and flooding. South Vietnam: only dry and wet season while temperature remains high all year round. Wet season lasts from November to April and wet season from May to October. For foreign tourists, the peak season of tourism in Vietnam starts around December and goes all the way to the end of March of the next year. These months fall right in the dry season of North Vietnam and Central Vietnam while in South Vietnam, it’s just the perfect time of flooding season in Mekong Delta when life comes back to the vast plains and wet forests. The summer months are the time Vietnam is less visited than other months due to the high temperature, more rains in North and North Central Vietnam. But these months are just perfect for beach break, photo trip, cheaper prices, and less touristy landscape. 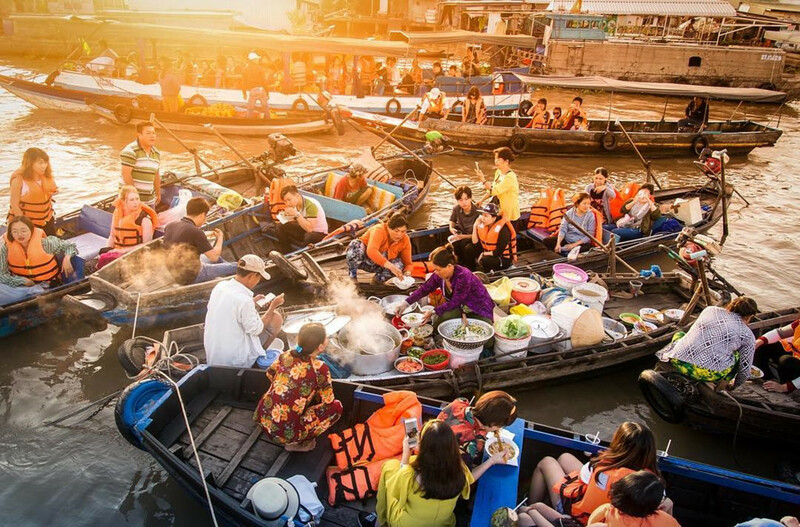 If you’re planning to visit several parts of Vietnam, then we should start the real work to find the best time to enjoy the most of your trip. 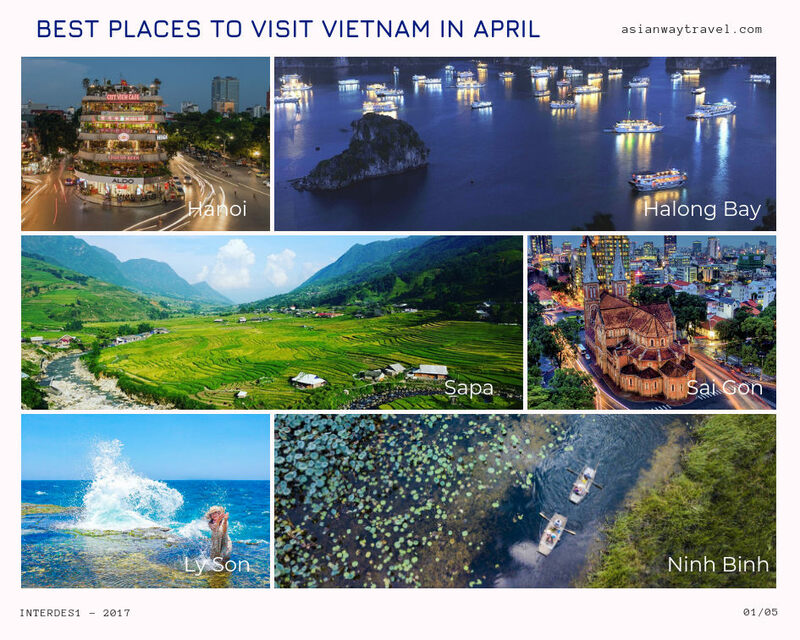 As you can see the table above, the best months to travel all popular attractions in three regions in Vietnam are February, March, April and March is the best month since it’s one of the ideal month to visit all these destinations. 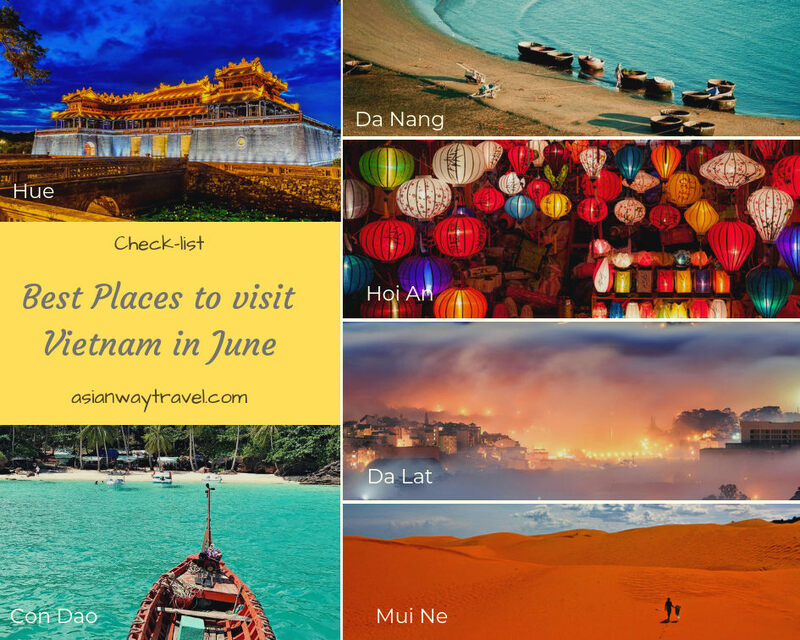 For more information on where to go and what to do in each month in Vietnam, we’ve made a set of check-list for all 12 months to help you see in the easiest way where you can go in each month. 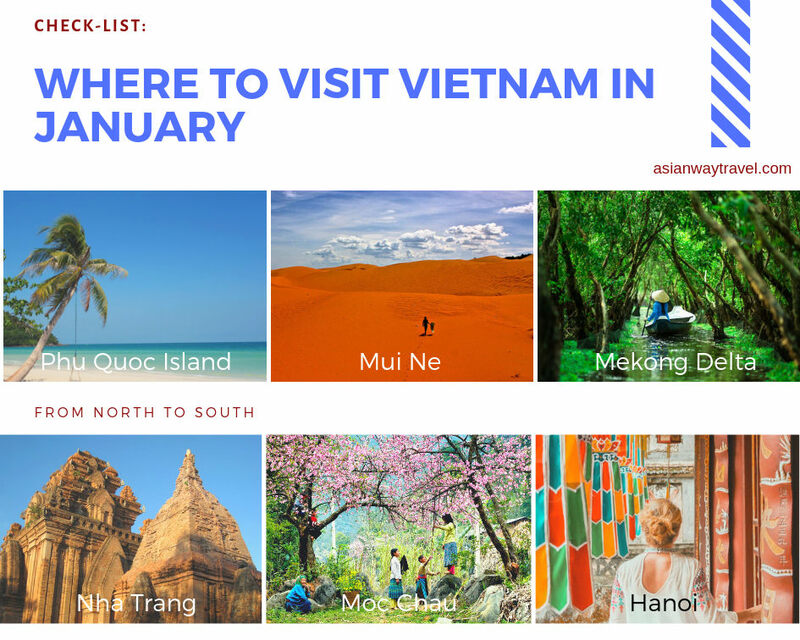 January in Vietnam is one of the best month for tourism activities and also the month with most diverse weather characteristics throughout the country. January is the first month of the year in Gregorian calendar but the last month in Lunar year. This makes the atmosphere in Vietnam generally bustling, festive and happy. North Vietnam in January is blessed with the prime of winter which bring almost no rain, dry air and low temperature (avg. 10-15 degrees Celsius). Water activities in Halong Bay, Cat Ba island and other beaches in north Vietnam are quite impossible because of the cold temperature. In Sapa there’s a chance that it might snow. Central and South Vietnam in January are warmer than North Vietnam with avg. temperature at 20 and 30 degrees Celsius. If you’re seeking some tropical sunlight then we suggest you to go south. 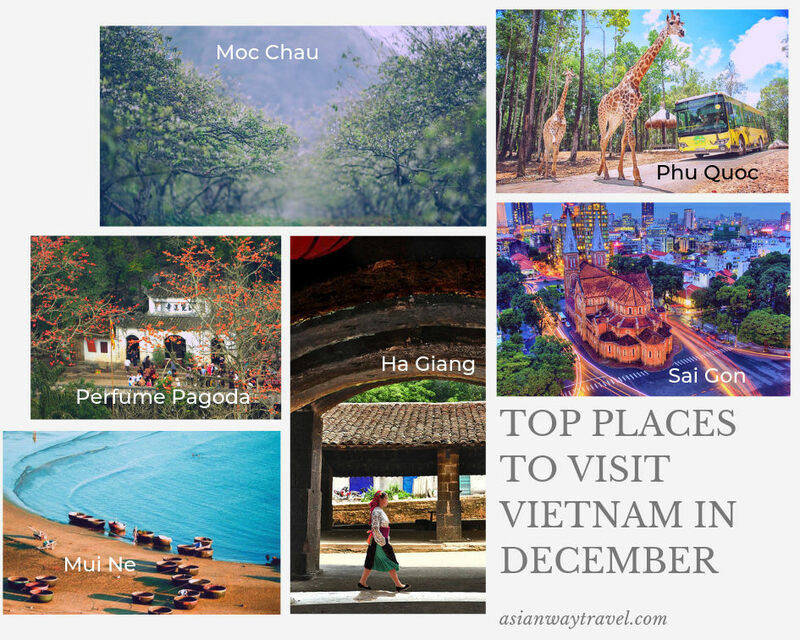 There are a lot of things to do in Vietnam from north to south in January. In north, you can enjoy the festive atmosphere when lunar new year coming so close. In central and south, beach paradises and pristine islands are in the best time for swimming, snorkeling and diving. Not much different from January, February has a dry, bright weather across the country with temperature raising southward. 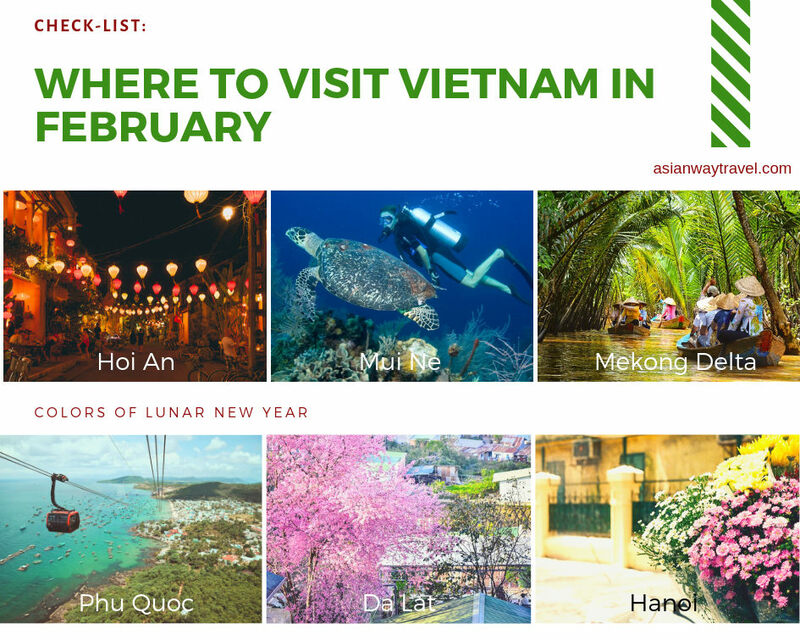 This month is also the first month of lunar new year, so you can you the festive atmosphere of the most important holiday in Vietnam everywhere you go. North Vietnam still is in winter time, clear skies with little rains which bring a certain romantic feeling to the new year since people say if it rain in the first day, the whole year will be lucky. Northern mountainous areas are covered in pastel colors of plum, apricot, peach blossoms with the backdrop of grey mountains. Weather in Central and South Vietnam offers a great condition for a beach break with clear, sunny skies and warm sea water. Average temperature is from 25-27 degrees Celsius. Like January, you can visit a lot of places in Vietnam during February, especially since February is a season of flowers. As mentioned, this month is lunar new year month, so you should visit major cities to enjoy the culture and the cuisine. 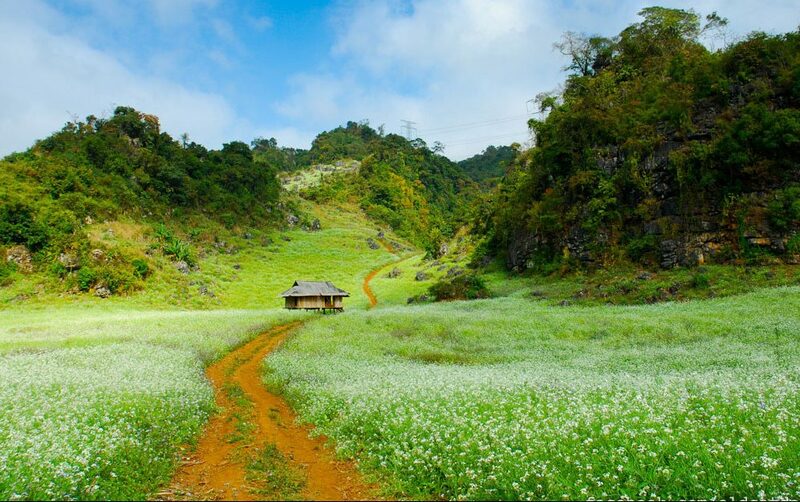 Come to north Vietnam plateaus to breath in the fresh air and enjoy natural landscape of spring blossoms. Drift south if you want to work on your tan and enjoy the water. Da Lat also sees a beautiful sight of cherry blossoms in this time of year. 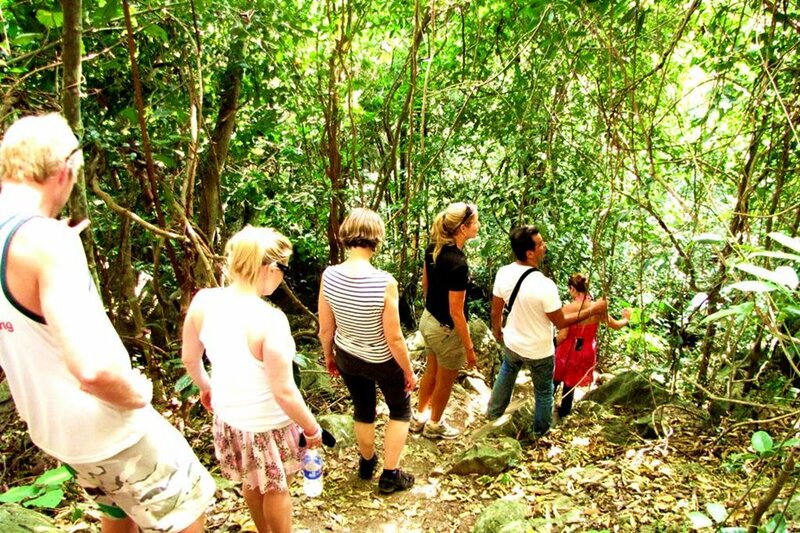 March is one of the best months to discover Vietnam with an ideal weather suitable for all kinds of activities. In north Vietnam, march is not as cold and dry as January and February while in central and south Vietnam, it’s warm and dry. March is the month that many festivals are held throughout the country, of which the most bustling and important is Perfume Pagoda festival. People from all parts of the country coming here to pray for luck, health and happiness in the upcoming year. Many central coast cities in this time turn into a beach paradise with warm water, mild weather and pristine culture. Southern islands are still the places to go for high blue sky and sunny beach. 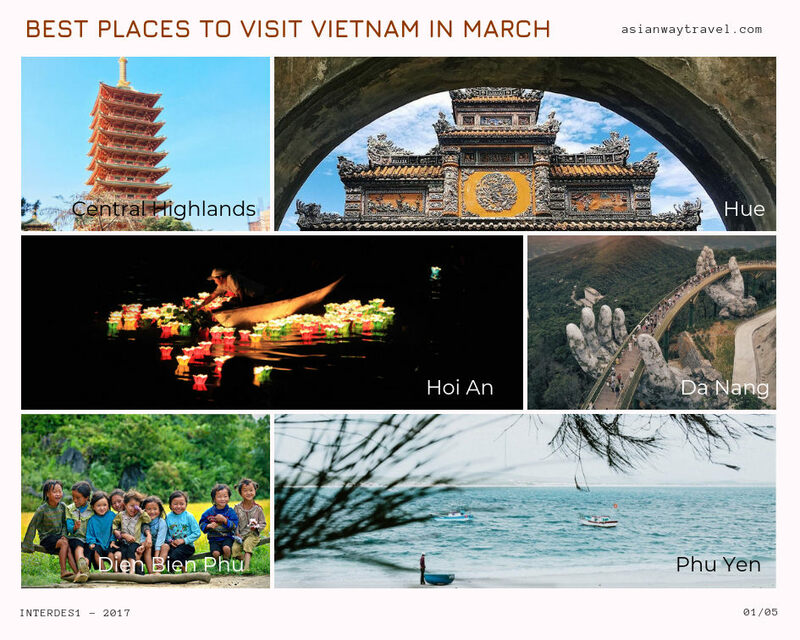 It’s not at all to choose where to visit in Vietnam in March. It’s the month for almost all destination both famous attractions and off-the-beaten-path destinations. Tay Nguyen in this time has white coffee flowers season blooming all over the places and also the most bustling festival in the area – Elephant Racing Festival. The central coastal line Hue – Da Nang – Hoi An is just in the right time for you to explore. If you want to visit south Vietnam, Ho Chi Minh city in March is perfect to visit. April marks the end of tourism peak season in Vietnam. 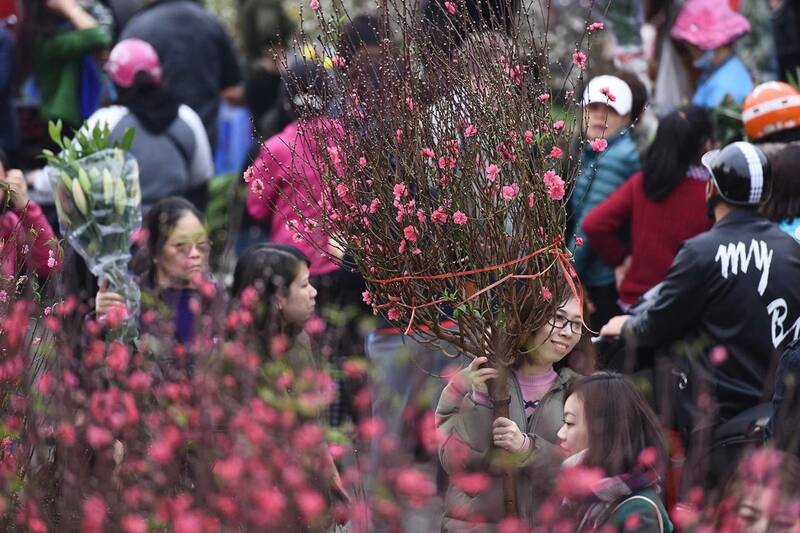 It’s the last month of spring, wrapping up the festive season of Lunar New Year as well as the winter in North Vietnam. From this month onward, the average temperature and humidity throughout the country rise. Still, the weather in March is still much milder than summer months and there’re still many things to do and places to see in this time of year. In North Vietnam, it’s getting warmer with less colder days, slightly more rainy but you can expect plenty dry days to see around. In Central and South Vietnam, it’s not different much from summer with average temperature 25-33 degrees Celsius. April is also a historical month in Vietnam history, marking the reunification of the whole country after Vietnam-America War. Hanoi in April turns vibrant red with the flags and flowers everywhere you go. Perfume Pagoda in the suburb of Hanoi is also in the month it’s most beautiful and less crowded since the festival ended. April is also the month to visit Vietnam best beaches and islands like Halong Bay, Co To Island and Ly Son. In north Vietnam, it’s the time farmers watering the rice fields, making a gorgeous sight of nature. 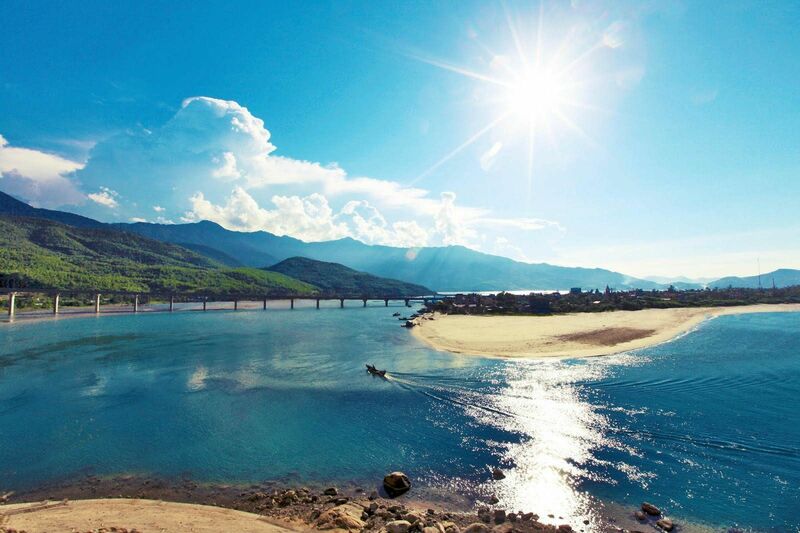 In central Vietnam, April is most ideal to visit Da Nang city with average temperature of 27-29 degrees Celsius. The beaches have blue water and calm waves. May is the month right before summer hits north Vietnam. You can see the season changing in north Vietnam so blatantly and beautifully. The sun shines, nice breezes and temperature rises slightly to 30 degrees Celsius. However, you can barely feel the heat in early May. The rain happens more frequently but also end quickly. Throughout the country, the summer holiday for students is about to start so you can feel a certain excitement of Vietnamese people. In central and south Vietnam, the rain starts to happen more but not as frequently as the north. 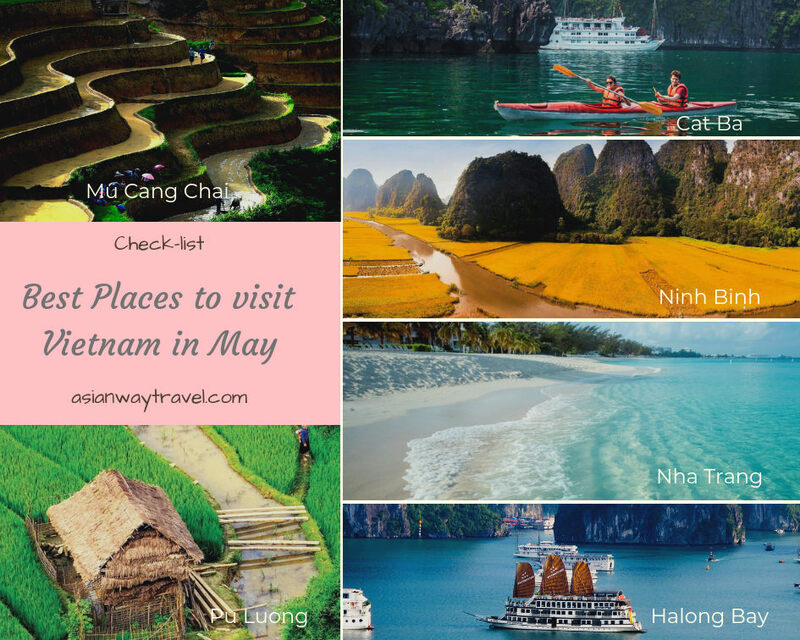 May is great time to visit the major cities of Vietnam. Like April, May is also a historical month with two important events: Dien Bien Phu Victory on May 7 and Ho Chi Minh’s Birthday on May 19. Come to mountainous areas in north Vietnam to see the terraced rice fields turn into mirroring patches filled with water in preparation for the next crop. This sight in Mu Cang Chai is just heavenly to beholders. Visit Ninh Binh for its butterfly season from late April and May. Beach paradise like Nha Trang and pristine island like Cat Ba have the best condition of sea water for you to enjoy. June is the first month of summertime in Vietnam, overwhelming you with a serious rise of temperature and humidity. This month also belongs to the wetter southwest monsoon in Vietnam, starting from May and ending in October. The rain will be much more frequent with intensity, storms might happen in the end of hottest days. When it’s sunny the skies are clear and blue, suitable for photo taking. In northern mountain areas, there is a real threat of landslides and flash floods so we suggest you to stick to the lowlands or southern Vietnam for safest conditions. Halong bay, southern islands, coastal line cities are the best destinations in Vietnam during June. Con Dao island has not only endless blue beaches but in this month, it’s the month of turtles hatching season. Halong Bay is bluer than ever and Da Lat is one of the best place to stay away from the heat and enjoy the cool air. Coastal cities have not only pristine beaches but also rich local culture. 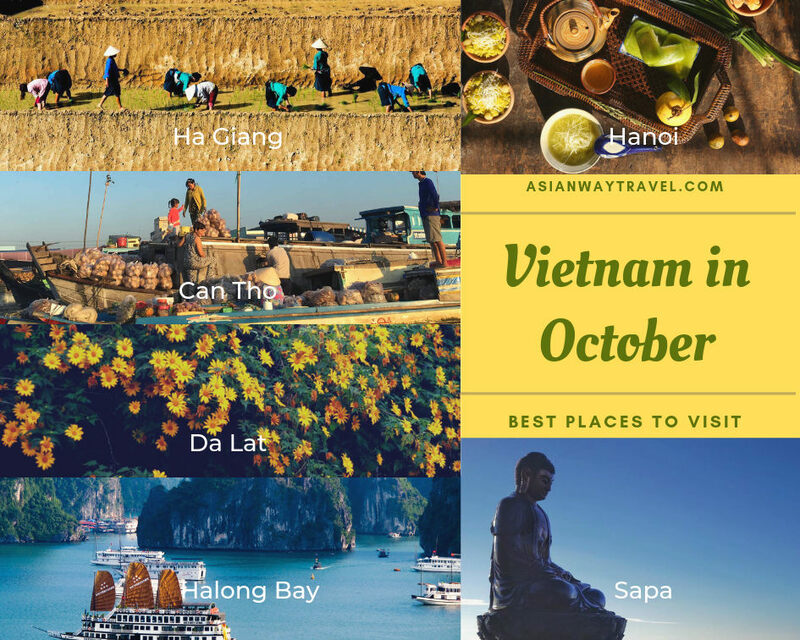 Nha Trang, Da Nang and Hoi An are the best places to go in this month. Temperature in July can reach to 40 degrees on hottest day and last just below that all the way until midnight. Like June, downpours happen around day’s end often with strong winds and thunders which might pose certain threats. However, this month is perfect to enjoy beach break across the country. You can choose the hottest days for a little trip to Halong, Phu Quoc or Nha Trang. In south Vietnam, the rainy season just hits its peak with daily downpours, especially in Mekong Delta. Central Vietnam enjoys a decent weather with sunny, warm weather with less rain than north Vietnam. 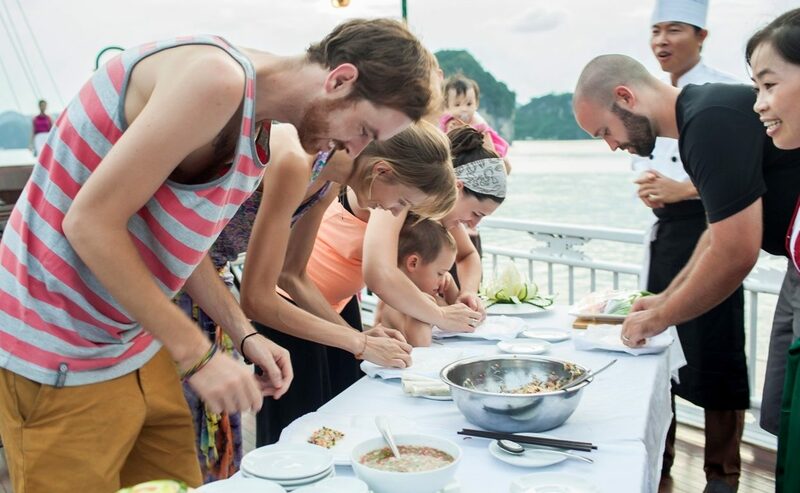 Halong Bay, Cat Ba Island and Southern Islands are best places to enjoy the cool ocean, sunny skies and savory seafood. 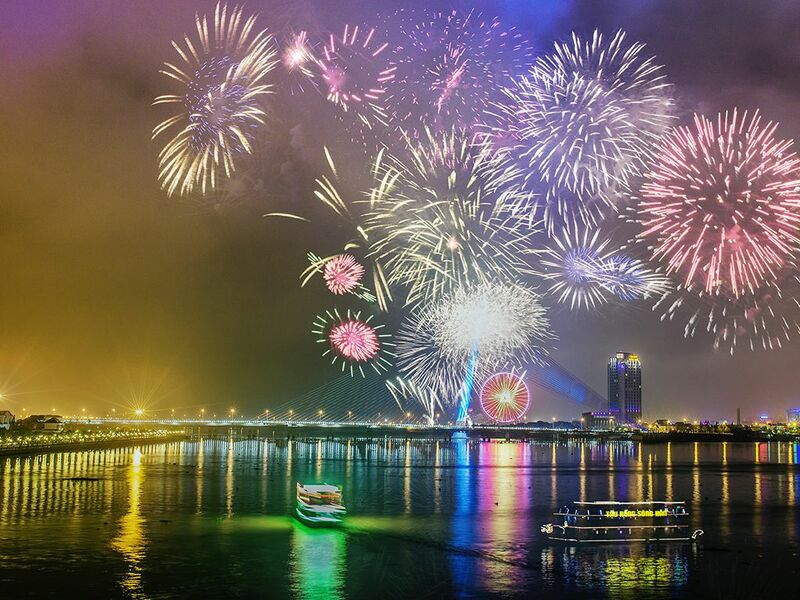 July is also great time to visit the cities of central coastal line: Da Nang, Hoi An and Hue. While major cities are places you should avoid because the heat might make you exhausted. Floods and landslides in northwest can happen after long, heavy rains. The temperature in August is still high but not as severe as in June and July and the rains can cool down the heat. Temperature ranges from 27 to 32 degrees in Hanoi and slightly lower in Da Nang and Ho Chi Minh city. 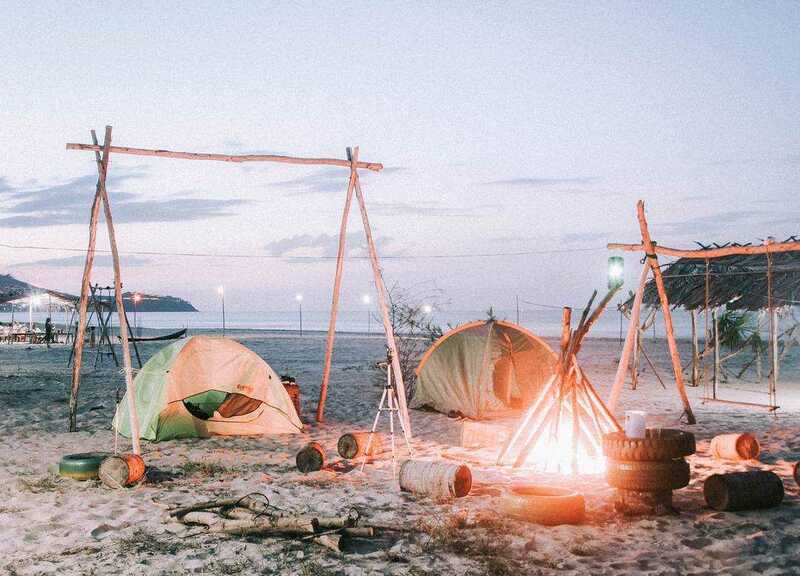 Anyone ready for a summer night camp in Nha Trang? In Mekong Delta, August marks the start of flooding season caused by Mekong river. Life slowly comes back to the wet forests, swamps and plains. Storms might happen in north and central of Vietnam. While rainy season still go on northwest mountainous areas. 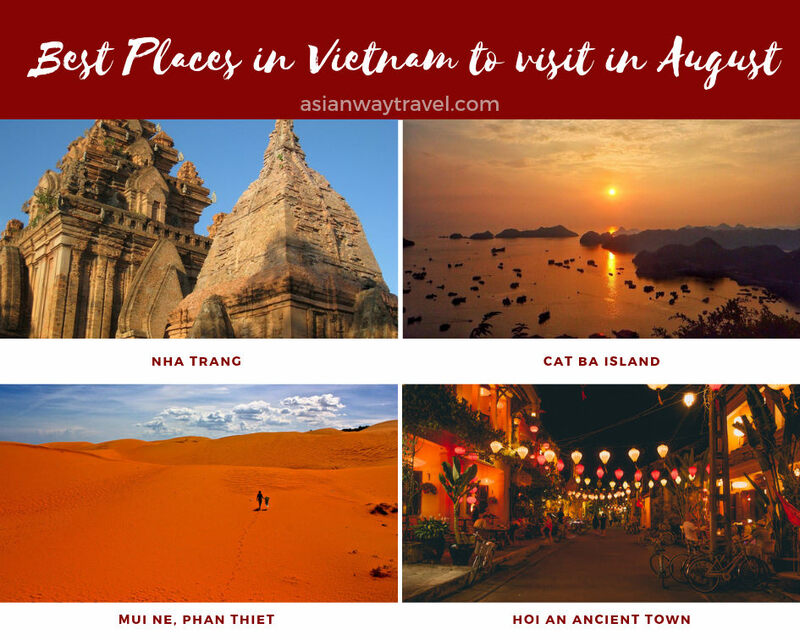 August is a great month to explore the caves in Phong Nha Ke Bang and Halong Bay, relax on the white beaches of Cat Ba island, Nha Trang, strolling the ancient town of Hoi An and have fun with sand sliding in Mui Ne. 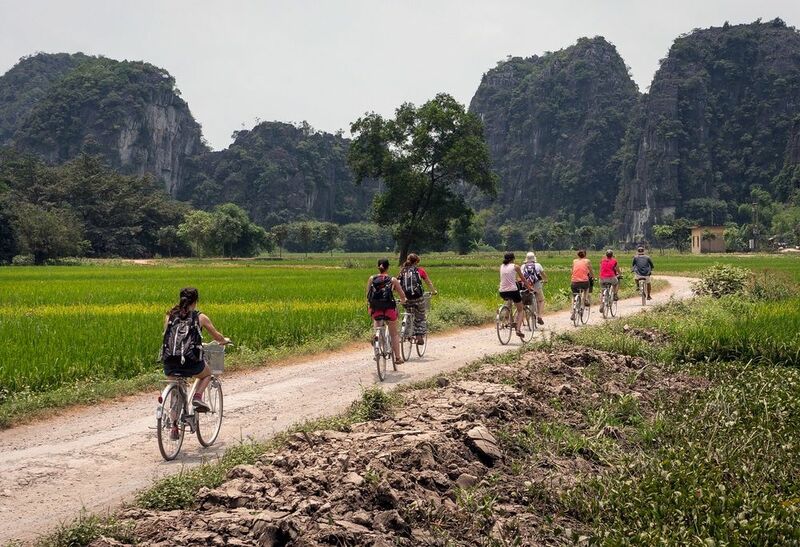 However, Mekong Delta isn’t ideal since it’s the rainy season in this month while trekking to mountainous areas in north Vietnam can be dangerous. When there’re typhoons, stay away from coastal beaches of the area where the typhoons hit. 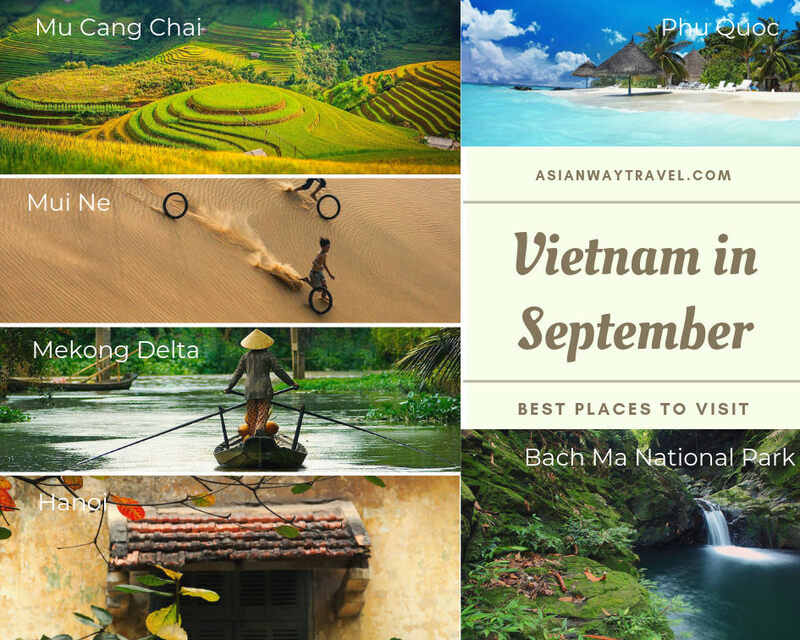 As one of the best month to visit Vietnam, September offers diverse weather conditions and natural landscape features across the country. September is also the ending of summer with temperature dropping significantly. In northern Vietnam, there is still rain but not as heavy as rain in June – August. While in central highlands, it rains more frequently. In south, rain is less and less while Mekong Delta enters in its flooding season. Cat Ba Island and Halong Bay have great conditions to enjoy the water and the scenery. Mountainous areas start their harvesting season: terraced rice fields turning golden. Northwest Vietnam in general and Mu Cang Chai in particular becomes a real cultural paradise with its gorgeous endless terraced rice fields and rich local culture. Bach Ma National Park in Hue should be your off-the-beaten-path to explore. Mekong Delta is just so beautiful in the flooding season. September brings a romantic atmosphere to Hanoi. Phong Nha Ke Bang is closed in its flooding season (September – November) and Hoi An suffers more rains in this month. Autumn officially arrives in North Vietnam when October starts: the skies are blue, cooler breezes and bountiful treats. Rain is lesser, the air is drier and temperature drops a little bit further. The beauty of northwest in October is in its prime. When you go to higher altitude, the air gets chillier. In central Vietnam cities like Hue, Hoi An and Da Nang, the rain continues but doesn’t make these cities any less beautiful then themselves in any other month. In south, average temperature is fixed at 24-31 degrees Celsius with much less rain. 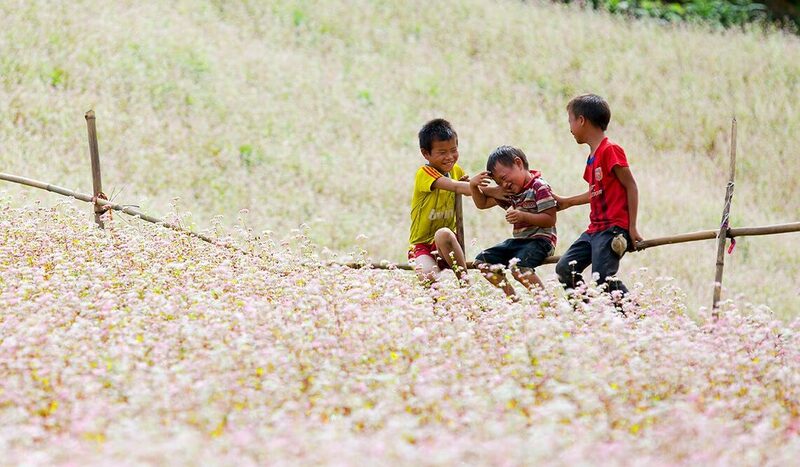 Ha Giang appeals visitors from all over the world with its beauty of golden terraced rice fields and pink fields of buckwheat flowers. Hanoi is best to visit in autumn and trekking in Sapa would be too strenuous when the heat is gone. In October, Da Lat becomes a romantic foggy town with all the colorful flowers blooming. Ba Be lake and Ban Gioc Waterfall show their full beauty in this time of year. 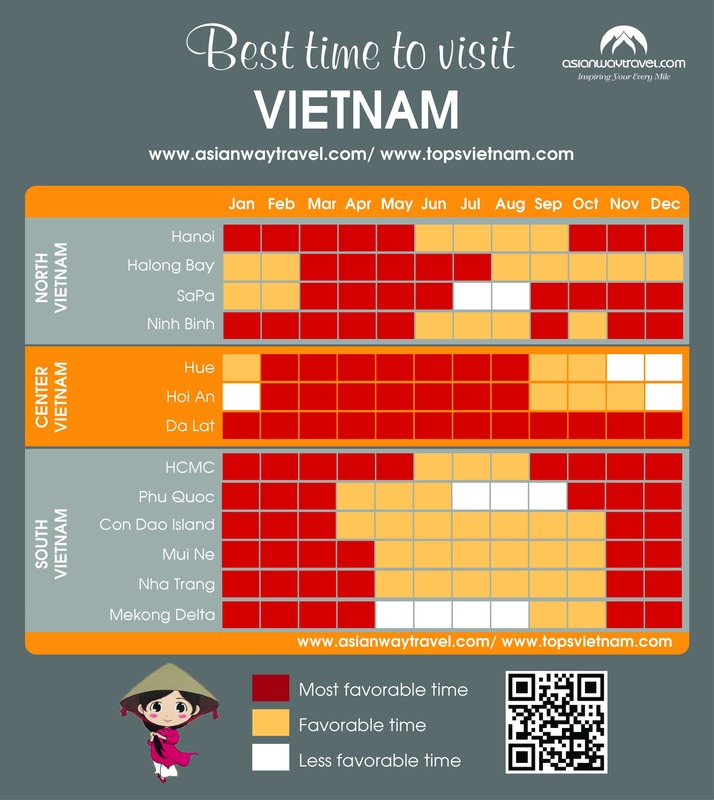 If you’re planning to visit Vietnam in November, you should expect to stay longer than you plan. Because Vietnam in November is incredibly beautiful. In north, the flowers start to bloom when temperature drops even further down, air is clearer and humidity is lower. 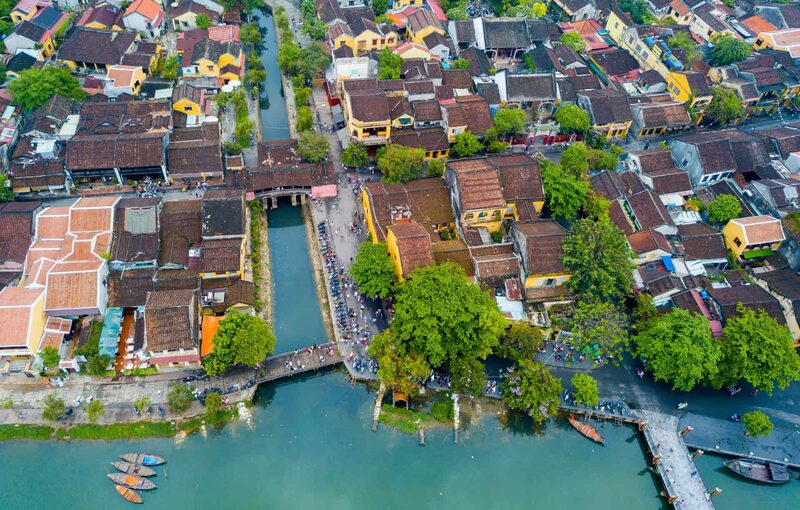 Central Vietnam is still in rainy season but it’s not a reason to not visit these destinations, in fact, people visit Hoi An for the rain. 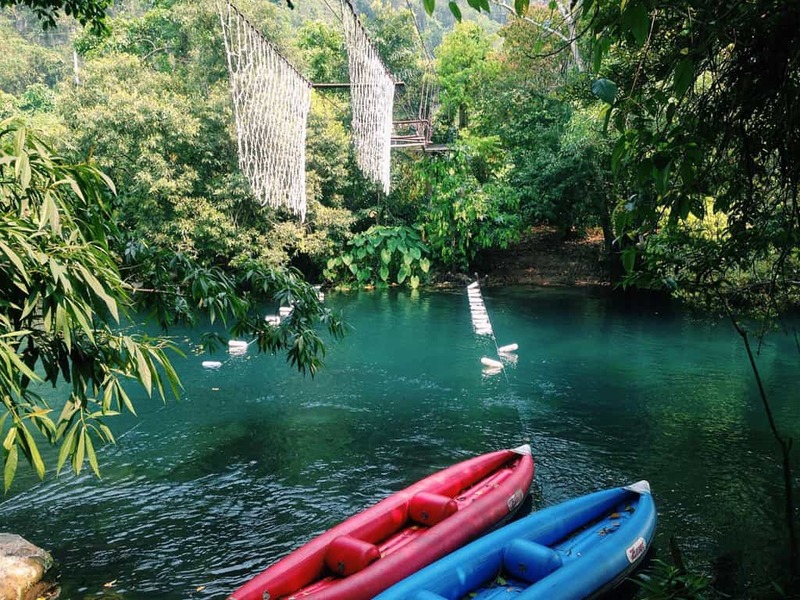 South Vietnam sees a sunny weather, suitable for all kinds of activities. 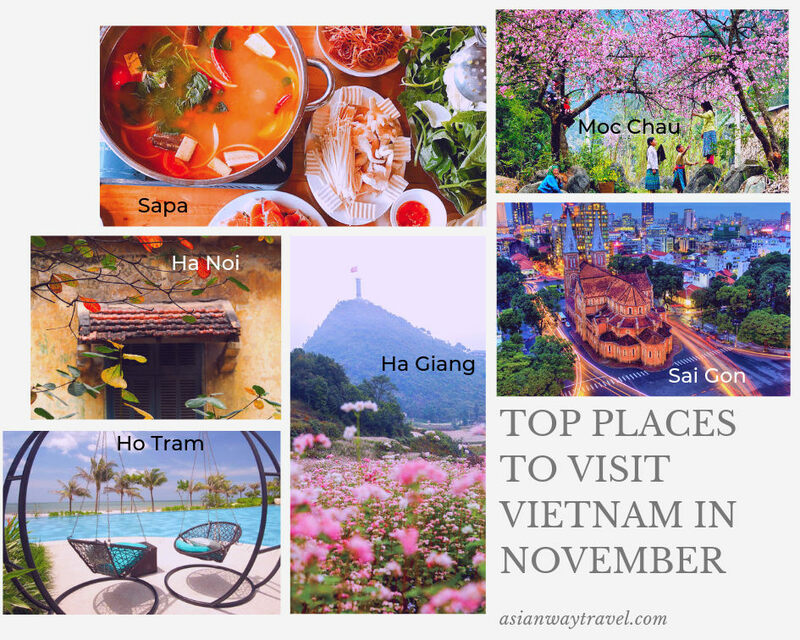 There are a lot of places to visit in Vietnam in November from north to south. Hanoi still can enchant its visitors with its nostalgic, transparent autumn. Northwest Vietnam takes the cake as the best destination to visit in this month, boasting the unique ethnic culture and traditions. In the south, beaches and islands offer calm waves and cool water to stay away from the tropical heat. As the most suitable month to visit Vietnam with least rain, you can visit many destinations in Vietnam without any weather hindrances. December is the beginning of winter in north Vietnam, average temperature dropping down to 20 degrees Celsius, with bright skies and chilly breezes. In central Vietnam, rainy season has ceased, returning the beaches their original beauties. Average temperature is about 24 degrees Celsius. In south, the sunny days continue with temperature of 26 degrees Celsius, sunny days and less humidity. If you want to stay away from the winter in North Vietnam, head south for some sunny beaches and warm water in Phu Quoc island. However, if the cold doesn’t bother you, then Moc Chau is a best place in north Vietnam to explore the nature and culture of Vietnam. Ban Gioc waterfall, the most beautiful waterfall in Vietnam is still a true beauty in this time of year. Perfume Pagoda sees a poetic beauty of Yen river covered in full lilies blooms. Visiting Perfume Pagoda in its off-season is just so relaxing and you can truly appreciate the nature. Are you thrilled to visit Vietnam's best destinations in its best time of year? We are experts in arranging trips that can get the most out of Vietnam weather. For more information, contact us now or sending your requests to our email booking@asianwaytravel.com.